Mr. and Mrs. North was a radio mystery series that aired on CBS from 1942 to 1954. Alice Frost and Joseph Curtin had the title roles when the series began in 1942. They were not professional detectives but simply an ordinary couple who stumbled across a murder or two every week for 12 years. The radio program eventually reached nearly 20 million listeners. The series was first brought to television in 1946. This television comedy drama with sophisticated wit and casual humor, aired from 1952-1954 and centered around a married couple living a normal life in New York City. Pam (Barbara Britton) and Jerry North (Richard Denning) made their living as publishers of a mystery magazine, but they are also pretty good amateur detectives who investigate various crimes and solve them before the police do. 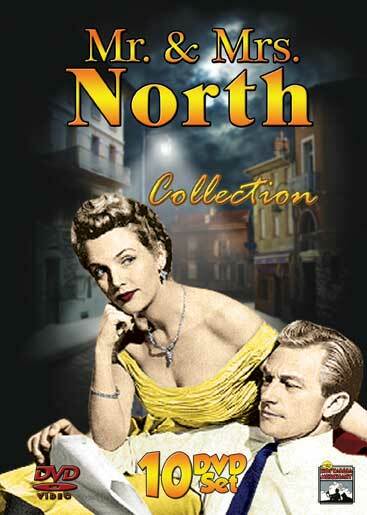 This is the largest collection of Mr. and Mrs. North available. 45 episodes on 10 DVDs. Weekend Murder, Till Death Do Us Part, A Good Buy, These Latins, Nosed Out, The Forgotten Grave, Dead Man’s Tale, Surprise, Comic-Strip Tease, Where There’s a Will, The Nobles, The Silent Butler, On the Rocks, Formula for Trouble, House Behind the Wall, The Beauty Prize, The Third Eye, Terror, Stranger Than Fiction, The Frightened Bride, Jade Dragon, Pretty Baby, Man Who Came to Murder Breakout, Hot Mink, Busy Signal, Salt in His Blood, Two Faced, Trained For Murder, Model for Murder, Million Dollar Coffin, Target, Reunion, Loon Lake, The Ungrateful Killer, Flight 217, Phantom at the Wedding, Homicide Limited, Shrinking Violet, Murder for Sale, The Placid Affair, The Girl in Cell 13, The Suspected, Mark of Hate, Quick and the Deadly.